Lightroom posts here will not be tutorials - you can get good short ones at places like Sean McCormack&apos;s and from these NAPP videos. In LR, the hows are far less difficult than understanding the whys. 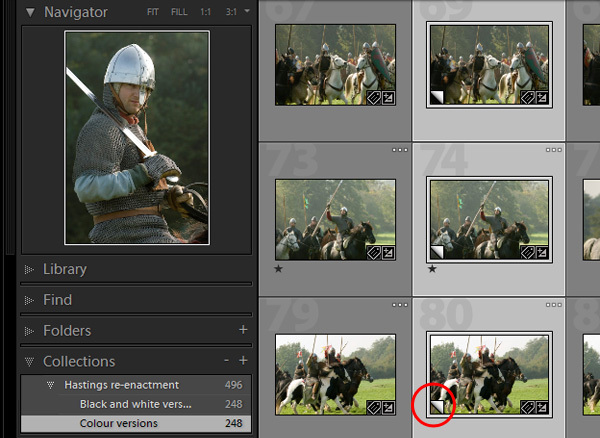 Here I hope to convey principles - such as the best practice for Lightroom&apos;s “Collections”. These virtual folders are just like iView&apos;s Catalog Sets or Portfolio&apos;s Galleries, so there&apos;s even less reason for using your folder system to organize your pictures (message: use folders like packing pallets into a warehouse - purely for storage, backup, easy recovery). But a couple of things are less clear - when should you use Collections less often, and when you should use them more? First, less - as a rule, do not use Collections when you should be using Keywords or Locations. This is partly to do with efficiency because a key DAM goal is to add as much description as you judge worthwhile, but it is also about the wide world outside Lightroom. Collections, Keywords, and Locations are all hierarchical, and for instance you could easily put animal or bird species into a Collection, or use another Collection to categorize images by Country / County / Town / Place. Instead use Keyword synonyms, so assigning one keyword makes Lightroom add the other too, and input geographical metadata in the proper IPTC fields which the metadata browser can read. (As an aside, it won&apos;t be long before we figure out how to sync geographical metadata over to keywords) Secondly, Collections are a Lightroom feature that aren&apos;t yet understood by other programs, unlike keywords and locations. So think carefully before you build up a Collection - is a Collection really the best place for that descriptive metadata? But do use Collections whenever you are creating virtual copies. While the video concentrates on creating versions of single images, that&apos;s not the point of Lightroom - and there&apos;s a nasty “gotcha” lying in wait. Imagine you want to create b&w versions of an entire shoot, tens or even hundreds of pictures. Easy - it&apos;s just a right click to make the virtual copies. But what happens later when you want to select just the black and whites, or just the colour ones? You can sort by Edit Time, but there&apos;s no easy way - unless you use Collections…. Immediately after you create the virtual copies, Lightroom deselects the masters and selects the new versions (see screen grab below). So, before you do anything else, hit Ctrl/Cmd N and add them to a new Collection. In fact, I&apos;d also do the same before you create the virtuals, so you can divide a shoot up into two or more Collections - also remember the Invert Selection menu command. I find the problem of selecting virtual copies so important that I&apos;ve even worked out the SQL to write the Collections directly to the database, but that&apos;s another story. So 3 points - force yourself to exploit Collections, don&apos;t use them for keywords and geographical metadata, and always use them when you&apos;re working with virtual copies. See slight change of thinking.